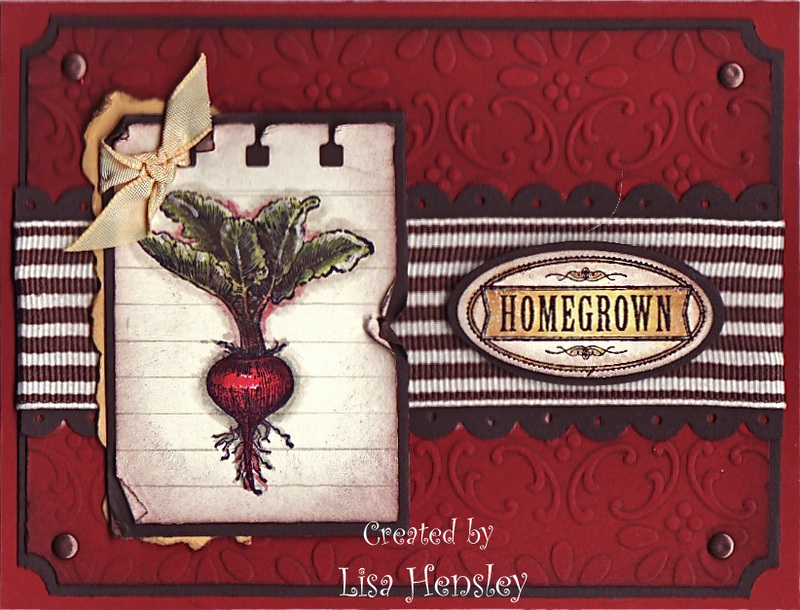 The Shabby Stamper: The February Creative Crew color focus challenge! The February Creative Crew color focus challenge! Here is my submission for the Creative Crew Color Focus challenge this month -- Cherry Cobbler, Early Espresso and Daffodil Delight. There isn't any card that can't be fabulous with Cherry Cobbler and Early Espresso in it, as well as some Close to Cocoa and Early Espresso sponged around the edges! The Cherry Cobbler layer was color embossed with Close to Cocoa. To achieve this distressed, vintage effect, I rubbed my Close to Cocoa classic pad across the 'flat' side of the Finial Press Textured Impressions folder. Insert your piece of Cherry Cobbler cardstock through your Big Shot. If you make your sandwich on Tab 1 of your multi-purpose platform, you'll get more ink transferred to your cardstock. I con't use any tabs to get just the merest amount of transfer, which I think gives it a more vintage look. To make the faux notebook paper, I stamped and watercolored my radish. Then cut the cardstock to the required dimension and sponged the edges front and back. I punched the top edge with the Spiral punch, then drew lines with a ruler. It's a very simple technique that packs a lot of punch! 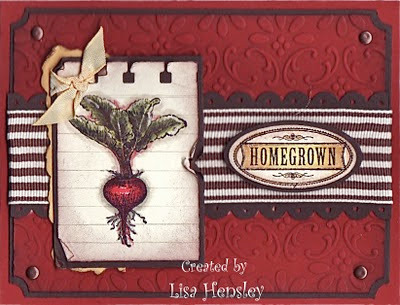 The 'Homegrown' label was stamped in Chocolate Chip craft ink, then clear embossed and watercolored. The highlights in the main image were made with a white gel pen. Wishing you bouquets of joy!